Dr. Ramos research is aimed at the intersection between sleep disorders, cerebrovascular disease and neurocognitive aging in population based studies. His work started with the multi-ethnic cohort of the Northern Manhattan study (NOMAS), where he completed a diversity supplement grant from the NIH/NINDS, aimed to determine the sleep disorders associated to stroke risk factors and cognitive decline in NOMAS. Dr. Ramos is co-investigator and Hispanic Community Health Study/Study of Latinos (HCHS/SOL) at the Miami site; where I serve as primary consultant for Sleep Research. Dr. Ramos obtained an R21 through the National Institutes of Aging to evaluate sleep phenotypes, neurocognitive decline and incident dementia in HCHS/SOL. He was also the site-PI for the Sueño study-Sleep as a Risk Factor for Disease in HCHS/SOL –at the Miller school of Medicine. This NHLBI ancillary study evaluated the determinants of abnormal sleep patterns with actigraphy and their effect on cardiometabolic diseases. Dr. Ramos was the principal investigator of an HCHS/SOL ancillary study evaluating sleep apnea and cerebral hemodynamics as an early marker of cerebrovascular risk at the Miami field site. This study was supported by a K12 mentored award from the Clinical Translational Research Institute at the Miller School of Medicine. 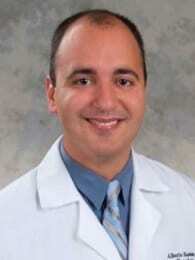 He is a member of American Academy of Sleep Medicine and American Academy of Neurology.